Kyle Cathie Limited, 9781906868062, 600pp. 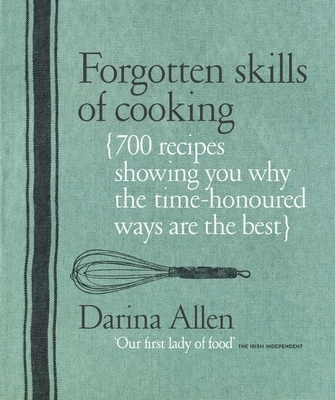 In this timely new book, Darina reconnects you with the cooking skills that missed a generation or two. The book is divided into chapters such as Dairy, Poultry and Eggs, Bread, and Preserving, and forgotten processes such as smoking mackerel, curing bacon, and making yogurt and butter are explained in the simplest terms. The delicious recipes show you how to use your homemade bounty to its best, and include ideas for using forgotten cuts of meat, baking bread and cakes, and even eating food from the wild. The Vegetables and Herbs chapter is stuffed with growing tips to satisfy even those with the smallest garden plot or window box, and there are plenty of suggestions for using gluts of vegetables. You'll even discover how to keep a few chickens in your backyard. With over 700 recipes, this is the definitive modern guide to traditional cooking skills. Darina Allen runs the world-renowned cookery school at Ballymaloe in County Cork, Ireland, which she founded with her husband in 1983. She runs the highly regarded three-month diploma course as well as various short courses, including the Forgotten Skills series, which is the inspiration behind this book. Darina is the award-winning author of Irish Traditional Cooking, Ballymaloe Cookery Course, A Year at Ballymaloe, Healthy Gluten-free Eating (with Rosemary Kearney), and Easy Entertaining. She is Ireland's most famous TV-cook, having presented nine series of her cooking program, Simply Delicious, on television around the world. Darina founded the first Farmers' Markets in Ireland and is a tireless campaigner for local produce. She is a natural teacher and was awarded IACP's 2005 Cooking Teacher of the Year Award.